Nigerian pop star, Ase has dropped a new single and it is definitely a show stopper. 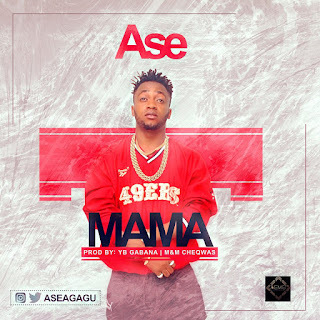 The single titled 'Mama' is a fusion of beautifully put together tune, vocals and a powerful message.The lyrics is themed around reciprocating a mother's unconditional love with kindness and not wickedness. Ase doesn't end there with his beautifully captured message, He goes on to implore his listeners to refrain from "hurting their mothers for material things". Certainly, Ase appears to be singing from a place of experience (not necessarily personal we must add) as more often than not, young men and women get diabolical all in the pursuit of wealth and unfortunately, mothers pay the deadly price for their pursuit. Produced by YB Gabana and mix and master by Cheowas, 'Mama' is an exciting work by geniuses. How the soft tempo beat fused with a remix of Awilo Logomba's classic, "Mobimba Ya Mama" is craftily put together is proof that amidst the upliftment of rhythm over message, the Nigerian music industry is finally beginning to give credence to music with meaning and Ase is joining the pioneers of meaningful music. We can't stop without pointing out that Ase's vocals is to die for! The young man has got talent just waiting for the world to embrace.